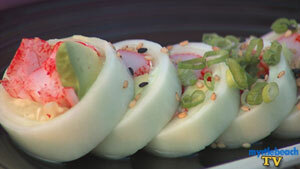 This aggregate Myrtle Beach Restaurant News section is provided for our visitors. If you have an article you wish posted here, please send us the article along with your name and contact information to: news@mbscr.com. Overtime Sport Bar in North Myrtle Beach has closed. A call to the restaurant this morning confirmed this. No more information is available at this time. This is sad since it was a favorite for locals and visitors alike. They had the best Wings. Cell users with Smartphones have sent requests to remove the pagination on the lists. They would rather swipe and watch the reviews and restaurants fly by! Ok. I get it. Pagination is now gone. So, swipe and fly! Enjoy this site. If you have any ideas, suggestions or maybe you would like to help out here, please let us know by going HERE and drop us a note. Thank you to everybody that makes this site work. We have added a new listing option that allows you to find Restaurants for Vegan or Raw food venues. I was amazed on how many local restaurants cater to this expanding group of people who are changing their lives by changing what they eat. The old addage is true.. You are what you eat. If you know of any restaurants that serve Vegan and or Raw Food please let us know HERE. Thanks! Croissants Bistro & Bakery is pleased to announce they have received two prestigious national awards recognizing their excellence in wedding cake design and execution. These distinguished awards include: 2014 winner for best wedding cake bakery in The Knot Best of Weddings, as well as the 2014 WeddingWire Couples' Choice Awards winner. 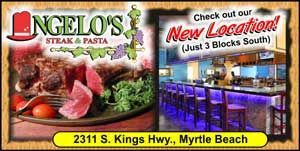 Angelo's Steak & Pasta is celebrating the opening of their new location, with a light, airy, Mediterranean decor, large bar with eight big-screen TVs, and nearly double the seating capacity, and triple the parking space, at 2311 South Kings Highway in Myrtle Beach. Angelo's will be featuring live entertainment, formal banquet room with chandeliers for private functions, and the same great menu featuring "The Greatest Steaks in the Universe." The owners of popular Villa Tuscana Italian restaurant in North Myrtle Beach have opened another eaterie in Myrtle Beach: Toscana Italian Bistro, located at 4209 North Kings Highway. Chef Veney once again offers an affordable authentic Italian fine dining restaurant, featuring homemade pasta, music, wine, liquor, and beer. 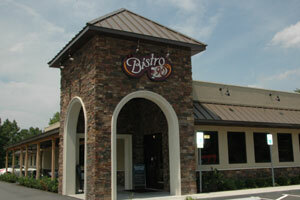 Bistro 90 on Hwy 90 in Longs offers great Italian cuisine as well as delicious appetizers and entrees. From the stone entrance on the outside to the beautiful decor inside, this restaurant welcomes you with a warm, relaxed feeling, which is cemented in when the owner or manager stops by your table to say hello. They offer several scrumptious lunch specials and generous portions. The creamy Parmesan dressing is a must to try. Pig Out BBQ in Little River has closed and Papis Texican Grill opened in its location, keeping some of the old architecture of the original building from decades ago, adding to the quaint charm of this hidden treasure. Make sure you ask for the made-to-order guacamole. The owner or manager comes to your table to ask how everything is -- which is always a nice touch that usually creates loyal, repeat customers. The immensely popular Dynamites at Doc Holidays at Vereens Marina in North Myrtle Beach, originally Dock Holiday's then a variety of other restaurants for brief periods of time, has closed. It more recently opened and closed as Pete's Landing, and is now open as Milliken's Cove. Fisherman's Hideaway on the waterfront in Little River has closed, the Cockney Cheddar, the area's only british-themed restaurant, replaced it. Cockney Cheddar subsequently closed, it reopened briefly as BJs on the Waterfront, and is now open and running as Fibbers on the Waterfront. We sincerely try to keep up with the multitude of restaurant changes in the Myrtle Beach area and the entire Grand Strand. But with so many restaurants, coupled with tremendous area growth and expansion, we sometimes miss a new restaurant opening, or one closing, or another news-worthy item about a local restaurant. If you see a restaurant listed on this site that has closed, or a new one that opened that's not listed here, or any notable restaurant news not mentioned on this site, please send us an email, and we'll update our records as soon as possible. The 25th annual Taste of the Town drew crowds of locals and visitors eager to sample some of the top local restaurants' specialties. Held at the Myrtle Beach Convention Center, proceeds from the popular event benefit the Saint Andrew's Catholic School in Myrtle Beach.